The CMP Products Themis Heavy Duty, Two Bolt, High Temperature Fire Rated Stainless Steel single cable cleat which has been designed, constructed, and tested in accordance with the International Standard ‘Cable Cleats for Electrical Installations’ (IEC 61914). It ensures the retention and securing of single cables, without damaging or deforming the cable. These Fire Rated cable cleats can be used with fire performance cables to ensure the safe retention and securing of single cables in the event of a wiring system being affected by fire. These fire resisting supports help to maintain the electrical systems integrity for any critical circuits during an emergency situation to enable safe evacuation. 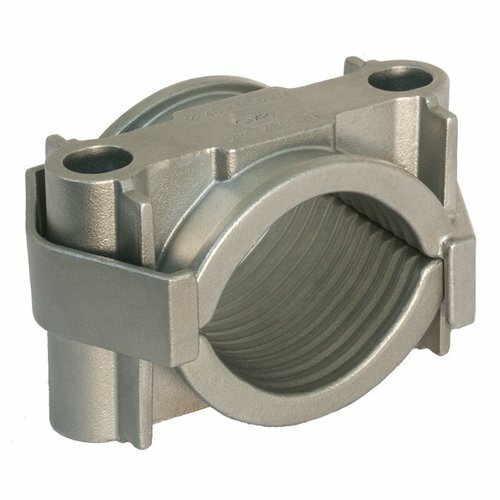 The cable cleat is manufactured from Stainless Steel 316L making it suitable for both indoor and outdoor applications. Due to its unique twin arc internal patent pending design profile it exhibits excellent retention, limiting both the axial and lateral movement. The Themis Two Bolt cable cleats have an excellent range take and are suitable for cable diameters of 38mm up to 97mm in only five sizes. This cable cleat has two M12 clearance holes for securing it to a mounting surface, which allows for either M10 or M12 fasteners to be used.